A 19-year-old male was mountain biking when he fell down a ravine. 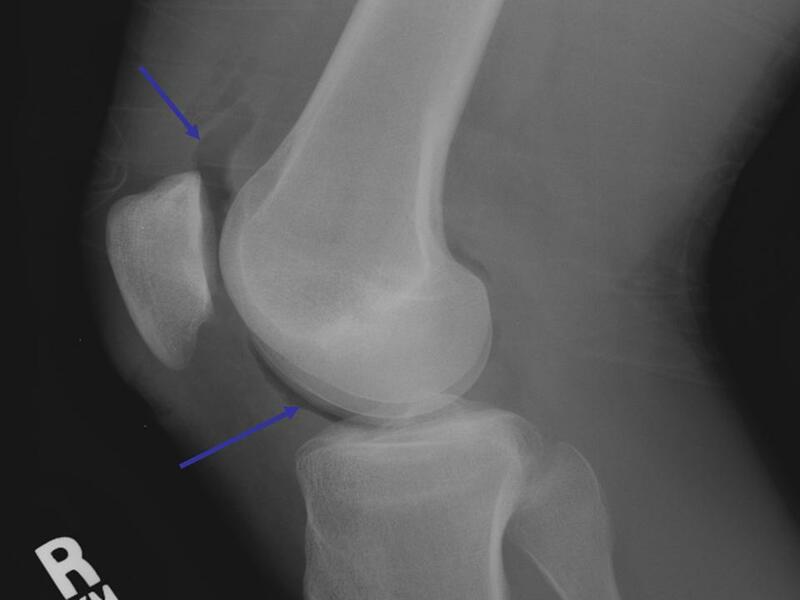 He presents with a moderate effusion of his right knee and laceration 3cm superior and medial to his patella. His vital signs include BP 170/98, HR 109bpm, RR 18, T 97 F, and SpO2 99% on room air. What are your next steps in evaluation and management? Initial evaluation should include a detailed examination of the affected joint, usually with the aid of local anesthesia. This goes without saying for many things in emergency medicine, but the first step in identification is having a high index of suspicion for open joint injuries, especially surrounding the knee. Recognize that the knee joint capsule extends up to 3-4cm above the superior pole of the patella. Fully assess the depth and severity of lacerations, assessing for proximity to joint capsule and potential violation of the capsule itself. Initial evaluation should include a detailed examination of the affected joint, usually with the aid of local anesthesia. Make sure to fully assess the depth and severity of lacerations, assessing for proximity to joint capsule and potential violation of the capsule itself. Recognize that synovial fluid may be present, but is easy to miss on exam, lack of evidence of synovial fluid leak does not exclude this injury. If there is evidence of joint space violation evident on your exam, no further work-up regarding open joint required, consult orthopedics. Imaging will likely still be required, however, for evaluation of concomitant fracture. Always remember to evaluate the joint above and below, check neurological/vascular status and compartments (a quick squeeze of the compartments provides a great deal of information), as well as the skin of the affected limb. Classification of open joint injury is loosely based off of Gustilo-Anderson classification system. Class I is low energy with a wound less than 1cm. Class II is a wound greater than 1cm with moderate soft tissue damage. High energy wounds greater than 1cm with extensive soft tissue damage are class III. Antibiotic selection and administration should be followed based on these classifications. Treatment of open joint injury is loosely based on literature from open fracture recommendations (8). Early broad spectrum antibiotic administration is recommended. Gustilo-Anderson Type I and II receive 1g cefazolin q8 hrs, type III fractures receive an aminoglycoside (3-5mg/kg/day) in addition to cefazolin. If organic contamination present, consider additional penicillin added Q4 hours. Remember to update tetanus vaccination in the ED if not up-to-date. You can also apply a sterile saline soaked gauze to the open arthrotomy to prevent desiccation. The patient should be taken to the operating room for urgent debridement and irrigation with a large volume of fluid. Disposition includes consultation with orthopedic surgery service and likely admission to orthopedic or trauma service depending on other injuries and institutional basis. CT of the knee demonstrates air within the joint, indicating open joint injury. There is also a tibial plateau fracture demonstrated on CT. The patient is given Tdap vaccine and 1g IV cefazolin. Orthopedics is consulted, and the patient is taken to the OR later that night. (1.) Collins DN, Temple SD. Open joint injuries. Classification and treatment. Clin Orthop Relat Res. 1989 Jun;(243):48-56. (2.) Fordham SD, Turner AF. Arthrography in penetrating injuries. JACEP. 1976 Apr;5(4):265-7. (3.) Nord RM, Quach T, Walsh M, et al. Detection of traumatic arthrotomy of the knee using the saline solution load test. J Bone Joint Surg Am. 2009 Jan;91(1):66-70. (4.) Konda SR, Davidovitch RI, Egol KA. Computed tomography scan to detect traumatic arthrotomies and identify periarticular wounds not requiring surgical intervention: an improvement over the saline load test. J Orthop Trauma. 2013 Sep;27(9):498-504. (5.) Konda SR, Howard D, Davidovitch RI, Egol KA. The role of computed tomography in the assessment of open periarticular fractures associated with deep knee wounds. J Orthop Trauma. 2013 Sep;27(9):509-14. (6.) Keese GR, Boody AR, Wongworawat MD, Jobe CM. The accuracy of the saline load test in the diagnosis of traumatic knee arthrotomies. J Orthop Trauma. 2007 Aug;21(7):442-3. (7.) Tornetta P 3rd, Boes MT, Schepsis AA, et al. How effective is a saline arthrogram for wounds around the knee? Clin Orthop Relat Res. 2008 Feb;466(2):432-5. (8.) Olsen SA, Willis MD. Initial Management of Open Fractures. In: Bucholz RW, Heckman JD, Court-Brown CC (eds). Rockwood and Green s Fractures in Adults (6th ed). Philadelphia: Lippincott Williams & Wilkins, 2006, p. 398. (9.) “Intraarticular wound with air.” Ortho Teaching, Feinberg School of Medicine, ortho-teaching.feinberg.northwestern.edu/images/ortho-teaching/case7-2.jpg.